I think a friend of mine recently offered me a spice rack. I turned it down, but now that I've started training on my culinary skills, I'm starting to regret that. 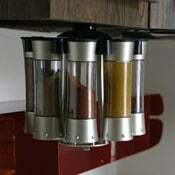 Still, maybe I can invest in one of these $32.95 under-cabinet auto-measuring spice carousels . Instead of having to shake, pour, shake, pour until you've filled that tiny teaspoon with the correct amount of spice , the auto-measuring carousel can dispense a quarter teaspoon at a time. Should you need to add a little more spice to your life, you can also remove the individual containers, pop their tops and pour until your tongue is on fire heart is content. And hey, if you don't have cabinets, you can let it stand free on your counter for guests to idly spin and experiment with centripetal force.